Richard Branson has joined the fight to reduce global warming. 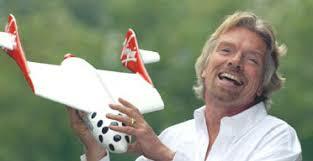 Branson has pledged $3 billion over the next decade. The funds will be used to promote and develop alternate sources of energy. The announcement was made at the Clinton Global Initiative, a conference put together by the former president to fight global warming and help clean up the environment. The conference is attended by political, non profit and business leaders. This year’s conference has been far more successful than anticipated. Last year’s conference generated a total of $2.5 Billion in revenue directed at combating global warming; this year’s pledges already stand at $5.7 billion with 114 contributors. The ever charismatic Branson said he hopes the funds will help to preserve the environment for future generations. I'm just your run of the mill African, have been a journalist since I graduated, I lived in Asia for 4 years, travelled Central and S America for a year and spent the last year travelling USA and Canada. I make my millions writing and painting. Likes: The thing I like best in all the world is 'The Muffin' (my own personal Canuck! ), my coffee machine, Canada, Music, nature and small children with candy. Dislikes: George Bush, Violence, TV, Botox, Celery (its from the devil), Pollution, people who throw trash out their car windows and George Bush. I’m convinced that when Branson retires he’s either going to try kill us all a la a James Bond super villain, or he’ll do more world-saving awesomeness. There is no in-between.